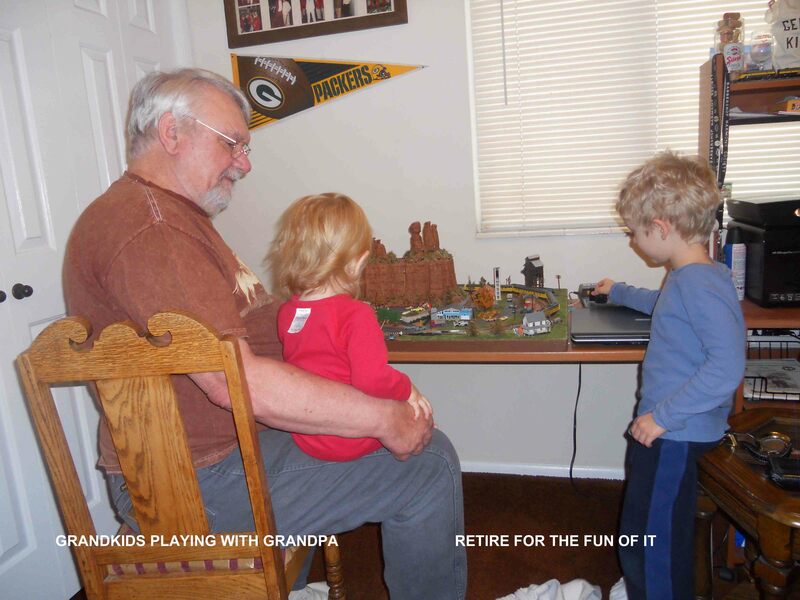 Lee played with model trains when he was his grandson’s age. 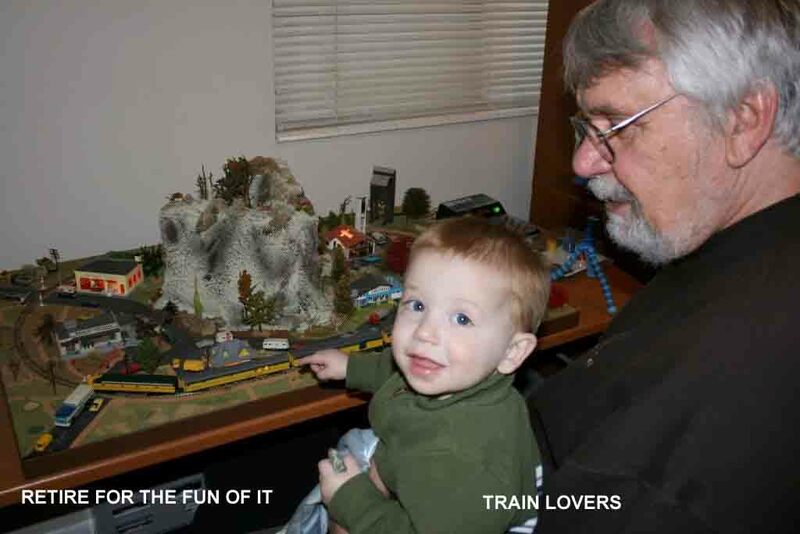 It instilled a love for trains that he still has today. We purchased a home for retirement that fits our empty nester life style, which only allowed room for an N Scale size train set. We found this 2’ by 3’ layout and a rolling table that fits perfectly in a corner of Lee’s office. 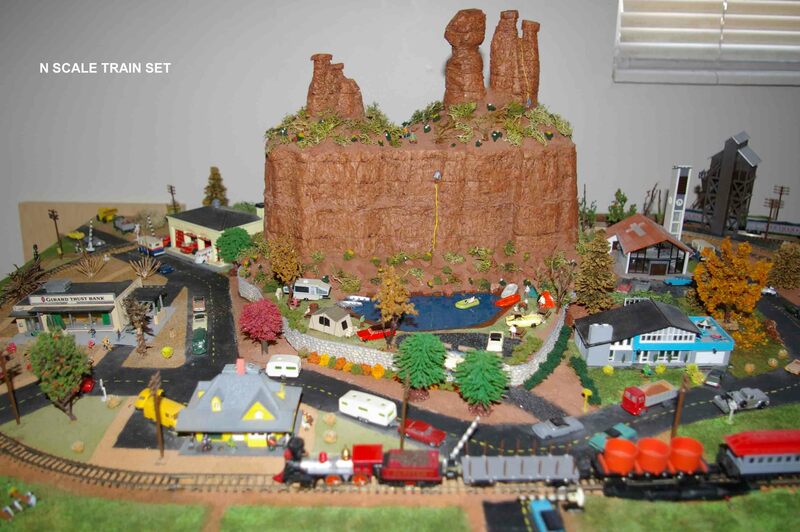 After learning about the techniques of remodeling a train layout, Lee changed the scenes to reflect our travels through the Moab, Utah area. The new mountain has red rock spires with trees, rock climbers and campers, surrounded by city life in miniature. The beach scene has all its available camping sites filled with trailers and tents, boaters, picnickers and swimmers. This is the kind of camping that we are looking for when we venture into the outdoors. How small is an N Scale layout? 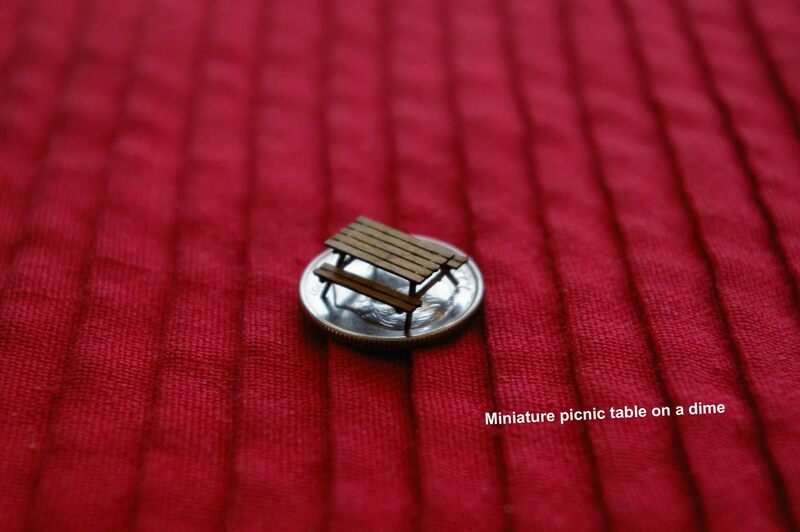 One of the picnic tables that Lee assembled fits on a dime and he made them all without a magnifying glass. Basically, N scale is half the size of the HO scale. The HO scale is half the size of the O scale model trains. All our grandsons begin their love of trains by playing with Thomas the Tank Engine, which is just the perfect scaled down size to fit their precious little hands. The youngest of our grandsons are now learning how to become expert train engineers. Lee has been sharing his love of trains with all seven grandsons and may need to be careful as to how many train sets he promises to build with the grandboys. 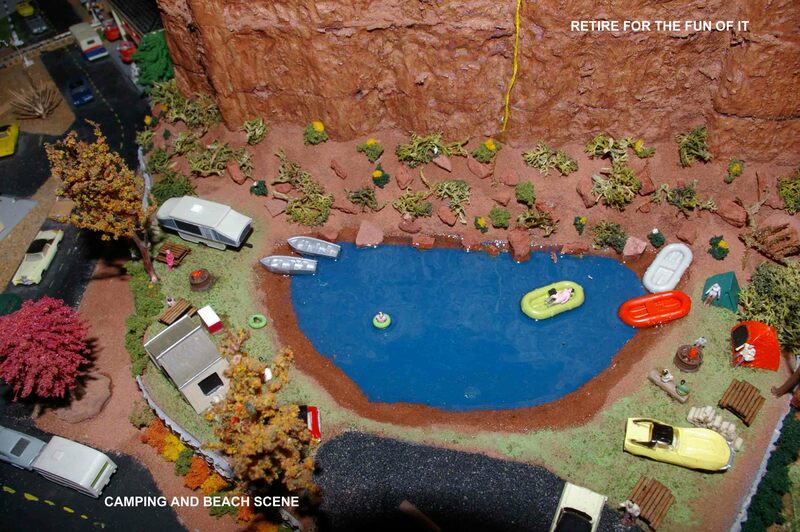 This entry was posted in HOBBIES, HOME and tagged camping, HO scale, Moab, N Scale, Recreation, Thomas the Tank Engine, Train Models, Train set, Utah on March 18, 2013 by Neva. It was good to hear from you. 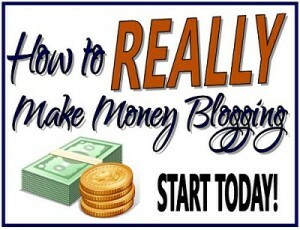 I’m glad to see you got your blog up and going. I love the Moab type design. That is one of my favorite places to go in Utah. Keep up the good work. Thanks, Christy. Being able to visit Moab often and live closer to our children were some of the major reasons we moved to Utah. Thank you for stopping by one of my blogs.